If your Grand Theft Auto Online toon vanished, as if it had been eaten by a Grue, and you were hoping to get it back, Rockstar says No. Any characters or character ranks that have been lost are gone for good and all, and the cash stimulus announced last week is Rockstar's way of making up the difference. Rockstar remains committed "to fine-tune the game to address any and all issues," and it asks players to keep an eye on the Rockstar Support site for further information. 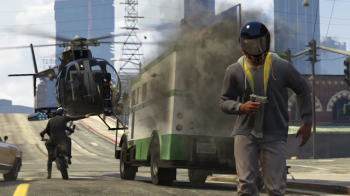 An upcoming patch should fix the vehicle loss issue, and there's more Online content to come, including Heists. But if you were hoping Rockstar was going to say when Heists and other content will become available, Rockstar doesn't know just yet. It hopes to have a confirmed release date soon. Some players are still reporting cloud server issues and having difficulty getting online, to which Rockstar says "we are still working on smoothing out the early technical issues with GTA Online and things should be getting much better now." It's been a rocky launch for Rockstar, and though the game has a lot of fans it doesn't take much imagination to see why so many of them are peeved. Cash buys stuff, but it doesn't replace lost ranks; only grinding will do that. Here's hoping you like a lot of frustration tacked on to your life of crime.